Magnesium is an essential mineral for calcium and potassium assimilation, and helps support proper nerve muscle impulses, enzyme reactions, formation of bone and carbohydrate metabolism. 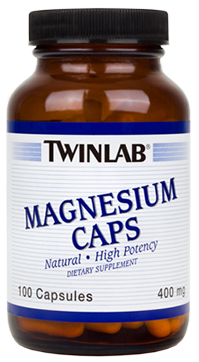 Magnesium Caps provide a natural, magnesium supplement with 400 mg, or 100% of the daily value, of magnesium. Take 1 capsule daily. KEEP OUT OF REACH OF CHILDREN.